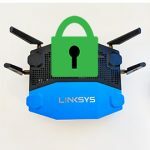 I am sure most of you are familiar with the Linksys WRT54G, a router that appeared in 2002 and was one of the first reliable devices of its kind, it was easy to use, affordable and most important, the software was open source. So, you could install DD-WRT, for example, and use the router as a business router, instead of actually buying an expensive one. 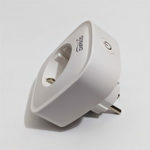 Note: The OpenWRT and DD-WRT were originally developed for the WRT54G to add more functionality, hence the WRT syntagm, but, we already know that open-source softwares can be used on most routers nowadays. 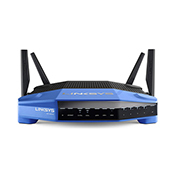 Based on the popularity, the Linksys released yet another router, something of a successor to the WRT54G, the Linksys WRT1900AC. 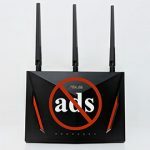 This router promised to deliver high speed, great coverage and overall, a high-quality, premium experience, but all these did not come at a cheap price tag. Note: Earlier in 2015, Linksys released a second version of WRT1900AC that lacked the fan, had better overall hardware, but the exterior design stayed the same. Not long after, Linksys released the third version of the router called WRT1900ACS which, again, had a better CPU clock speed, while maintaining the same, (now iconic) exterior design. But, Linksys released both the WRT1900AC V2 and WRT1900ACS under the same FCC ID, so, it had to release another version, called WRT1900ACS V2 to make up for that mistake (there are no changes to the internal hardware from the previous version). So, in this review I will use the second version of the WRT1900ACS. The design of the Linksys WRT1900ACS is in no way subtle. 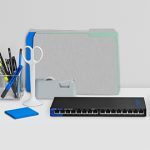 It features a solid, blue and black plastic case (just like the WRT54G), with four removable, upgradeable antennas, that are very sturdy and with thick rubber feet, which should ensure a proper stability. This design is meant to bring nostalgia and it manages this feat very well. It’s true that it doesn’t really look premium, but it certainly has its appeal (although it doesn’t have an ominous look, like some ASUS routers, it has a beetle-like appearance). The first version of WRT1900AC had an interesting addition, a built-in fan that acted out as a fail-safe in case of overheating, but the second and the final ACS version is stripped of this feature, adopting the common passive cooling, so the router is also a lot quieter. Unless Linksys would have decided to clock the CPU to 2.0GHz or more (which could overheat the device), there was no real reason to have an internal fan from the beginning. 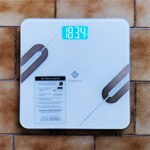 The WRT1900ACS is quite heavy and a bit chunky, measuring 9.7×7.6×2.0 inches and weighing 2.1 pounds and thanks to the no-subtle design approach you may have a hard time blending it with the furniture (unless you prefer it to be an eye-catcher). If space is of paramount importance, the WRT1900ACS can be wall-mounted (VESA-compatible). On front of the router there is the usual array of LEDs for connection status: Power, Internet, 2.4GHz, 5Ghz, eSATA, USB and Ethernet connections and the WPS. In the back, you can find the WPS button, four Gigabit LAN ports, one Gigabit WAN port, USB 3.0 port, USB 2.0/eSATA port (one of the few routers to have an eSATA port), RESET button, power socket and the ON/OFF button. 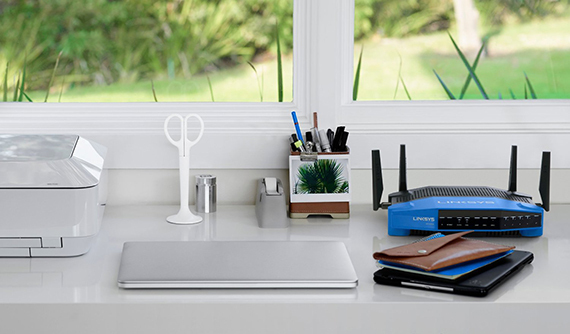 We have seen that a lot of routers which have a USB 3.0 port, like to place it on front, but it seems that the Linksys decided to place it on the back. This is a great decision as having it on the front can lead to a mess of cables. Design-wise, the Linksys WRT1900ACS is exactly what everyone (geek or not) has expected from the WRT54G successor. It may not be to everyone’s taste, but, personally, I liked it. In terms of hardware, the WRT1900ACS is a 3×3 three stream router and it features a dual-core 1.6GHz Marvell Armada 385 88F6820 CPU. This is a great increase in power from the older specs of version 1 (1.2GHz dual-core ARM processor). 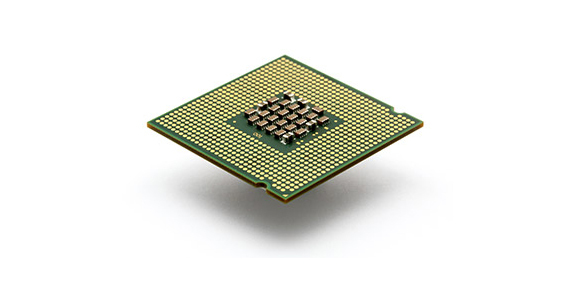 The CPU is backed by 512MB RAM from SK hynix (an upgrade from 256MB DDR3 RAM) and the same 128MB flash storage (Spansion S34ML01G100TFI00). The router is capable of delivering speeds of up to 1300Mbps on 5GHz and 600Mbps on 2.4GHz band. You can also attach a USB HDD in order to create your own NAS (Network Attached Storage). Although it has 4 antennas, the router remains 3×3, three stream router. It uses both explicit and implicit beamforming in order to focus its signal on clients and determines which of the four antennas delivers the best performance and dynamically switches between the four. 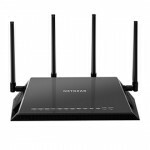 Because of the handy antennas and the beamforming, the router should have a great, optimized wireless performance. So let’s put it to a test. In order to test the true strength of the Linksys WRT1900ACS, we have paired it with the same model in bridge mode and the results are quite good. At close range (around 10 feet), on 5GHz and 802.11ac, the router scored 541 Mbps and at around 100 feet, we recorded about 355 Mbps. Using the 2.4GHz band (and the 802.11n), the Linksys scored 166 Mbps at 10 feet and 64 at 100 feet. 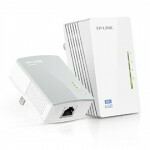 Comparing to the WRT1900AC version 2, the ACS has a better 5Ghz performance, but lower 2.4Ghz speeds at close range. Note: The WRT1900ACS has a really great range, reaching almost 300 feet on the 2.4GHz band. When coupled with a portable device through USB 3.0, we registered 87 MBps for writing a single 10GB file and around 111 MBps for reading it. This makes the WRT1900ACS one of the fastest router with this feature, faster than some dedicated NAS servers. Overall, the results are really great, the signal is stable and strong and the range is quite large. It is really close to the ASUS RT-AC87U in terms of performance. 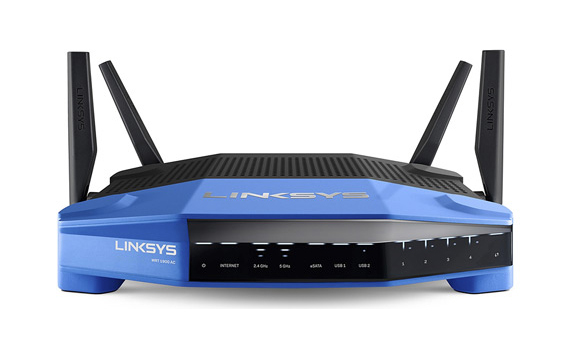 Important Note: The Linksys WRT1900ACS V1 Firmware is not compatible with the Firmware used on the WRT1900ACS V2. Setting up the router is quite straight forward and in about 5 minutes you will have the router running. The interface is user friendly and restarting it takes little to no time (while other routers need a couple of minutes). But there are some upsides and downsides. 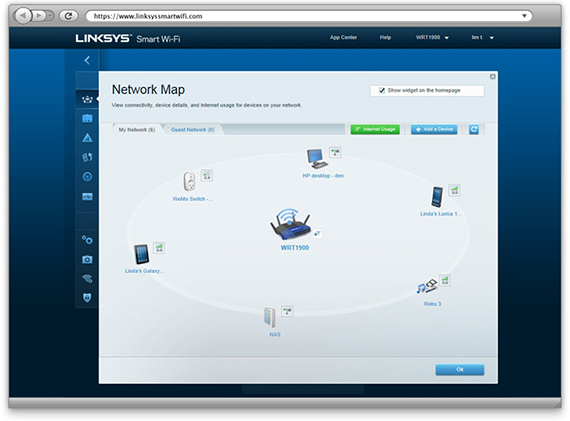 Linksys has introduced the Linksys Smart WiFi account, that although it isn’t necessary in order to operate the router, it can help you access the router from anywhere through the Linksys website. Also, it is quite low on features. 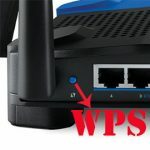 The basic router firmware isn’t really feature-rich and it seems that the Linksys Company has left this to the DD-WRT community (although making the WRT1900ACS, DD-WRT compatibile is a great thing). 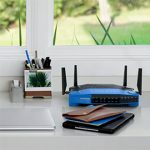 Still, you can fiddle with the Network Map, which shows you every device connected to the router and even the devices that are having trouble accessing the network. It has a DLNA media server, OpenVPN is now supported (the previous version did not) and you also get ftp and smb servers. The Guest accounts are punished too. 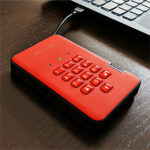 You can only choose a single password for both N and AC bands and users will have to enter that password in a web browser every time they start a new connection, which is tedious and annoying. Parental controls is present and it allows for blocking named network clients, but it is still low on features. So basically, everything, including the QoS is being toned down and kept at a basic level. You can keep the original Linksys WRT1900ACS firmware, but in order to really enjoy this router, I fully recommend an Open Source firmware, like OpenWRT, DD-WRT or Tomato. My final verdict is that the router does deliver a premium experience, has fast speed and coverage and it is less expensive than before (the price did come down a lot over the last year). 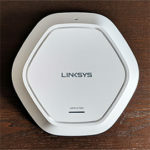 If the Linksys WRT54G made history in the router world, the Linksys WRT1900ACS is more generic, considering the competition (ASUS RT-AC68U, NETGEAR Nighthawk R7000) and although a worthy successor, it should be taken as a stand-alone.